고려 매병(梅甁)은 중국 송(宋)나라 매병에서 유래된 것이지만, 12세기경에 이르러서는 고려만의 풍만하면서도 유연한 선의 아름다움이 나타난다. 이러한 고려 매병의 양식은 이 작품에서 세련미의 극치를 보여주고 있다. 높이 42.1㎝, 입지름 6.2㎝, 밑지름 17㎝의 크기의 매병의 구연부는 작고 낮으며 밖으로 살짝 벌어져 있다. 어깨는 넓고 당당한 모습을 보여준다. 구연부의 아랫부분에는 꽃무늬를 둘렀으며 굽 위로는 연꽃무늬를 둘렀다. 몸통 전면에는 구름과 학을 새겨 넣었는데, 흑백상감한 원 안에는 하늘을 향해 날아가는 학과 구름무늬를, 원 밖에는 아래쪽을 향해 내려가는 학과 구름무늬를 새겼다. 학의 진행방향을 다르게 표현한 것은 도자기 표면이라는 일정한 제약을 넘어 사방으로 공간을 확산시켜 짜여진 구획으로부터의 자유로움을 추구한 듯하다. 이같은 표현상의 변화 추구와 함께 문양처리의 능숙함에서 고려 도자기의 우수함과 고려인의 창의력을 엿볼 수 있다. This type of ceramic vessel, generally called “prunus vase,” originated with the Song Dynasty of China; its unparalleled new aesthetic beauty was achieved by Goryeo potters in the 12th century. 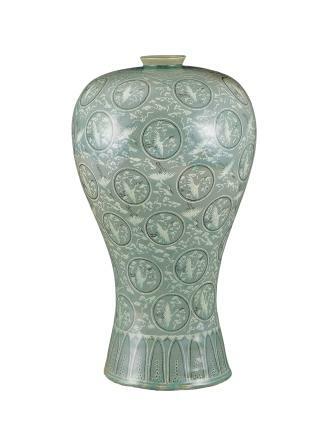 Goryeo’s prunus vases are characterized by a voluminous body showcasing attractively curvaceous lines. 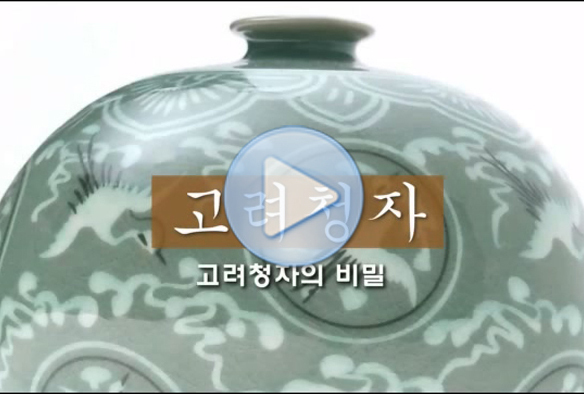 This particular prunus vase of Goryeo has height of 42.1 centimeters, mouth dimension of 6.2 centimeters, and foot dimension of 17 centimeters. It displays a low, small mouth with gently flared rim and wide, voluminous shoulder. Just above the foot are a circular floral design under the mouth and a lotus band. The main part of the body is covered with black and white inlaid design of cranes flying between clouds wherein those inside the double circles -- also inlaid with black and white slips -- fly upward and those outside fly downward. Art historians conjecture that the depiction of birds flying in two different directions represents the artist’s quest for freedom from a space limited by the vase by stretching it outside the material boundaries in all directions. 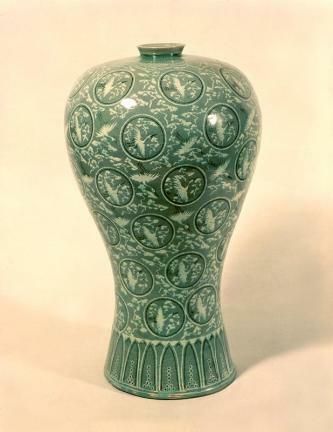 With the outstanding workmanship in terms of the application of decorative motifs and the successful quest for new aesthetic possibility with the traditional artistic medium, this prunus vase is often regarded as one of the finest examples of the excellent artistic creativity and manual skills of Goryeo celadon potters.